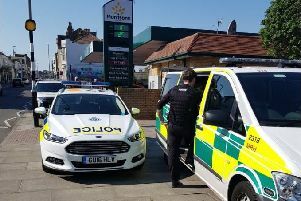 A 26-year-old man was attacked when a man jumped from bushes and repeatedly hit him over the head with a hammer in St Leonards. Detective Inspector Rob Morland said: “This was a unprovoked assault which left the victim with a cut to his head for which he needed hospital treatment. It is possible that this was an attempted theft.We are carrying out enquiries in an effort to trace the attacker who has been described as white, about 40, with a moutache and wearing John Lennon style glasses, brown hair and a beanie hat. “Anyone who recognises him or has any information is asked to contact detectives on 101 or email 101@sussex.pnn.police.uk quoting serial 1049 24/3. They can also call the independent charity Crimestoppers on 0800 555 111.